The Louisville and Nashville Railroad served the heart of the Southeast from New Orleans and Memphis to Atlanta and the Florida Panhandle. It also extended to St. Louis and later reached Chicago. 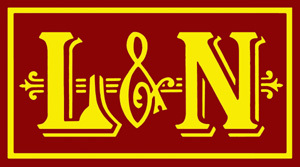 The L&N carries precedence as one of the few to maintain its originally chartered name, operating for more than 120 years as the Louisville & Nashville. It all began during the 1850s; through a combination of new construction and acquisition the road blossomed into a network of nearly 5,000 route miles. It was blessed with good management and thanks to a diverse traffic base, ranging from coal to general merchandise, sustained a strong level of profitability. During the early 1900s it was acquired by the Atlantic Coast Line and later went on to form part of the Family Lines System. This marketing consortium included several other carriers that eventually became the short-lived Seaboard System of the early 1980s. That decade witnessed Seaboard added to the burgeoning CSX Transportation empire. Today, many of L&N's principal routes remain in use by the Class I. According to the Louisville & Nashville Railroad Historical Society the Louisville & Nashville Railroad was created on March 5, 1850 when the state of Kentucky issued a charter for the company "...to build a railroad between Louisville, Kentucky, and the Tennessee state line in the direction of Nashville." A little more than a year later a similar proclamation was granted through Tennessee on December 4, 1851 which gave the L&N legal authority to construct a line from Louisville to Nashville. While no one knew it at that time one of the most successful railroads in American history had been born. It took some time to secure funding but the road finally began construction in May of 1853. The L&N's first segment officially opened on August 25, 1855 and work proceeded quickly to push rails southward towards Tennessee. After four years of additional labor the railroad's charter was completed when it opened to Nashville on October 27, 1859. Unfortunately, the Civil War halted additional growth and the conflict was particularly harsh for the L&N. During the height of rail travel the L&N was an important link for passengers either reaching the Gulf or East Coasts. 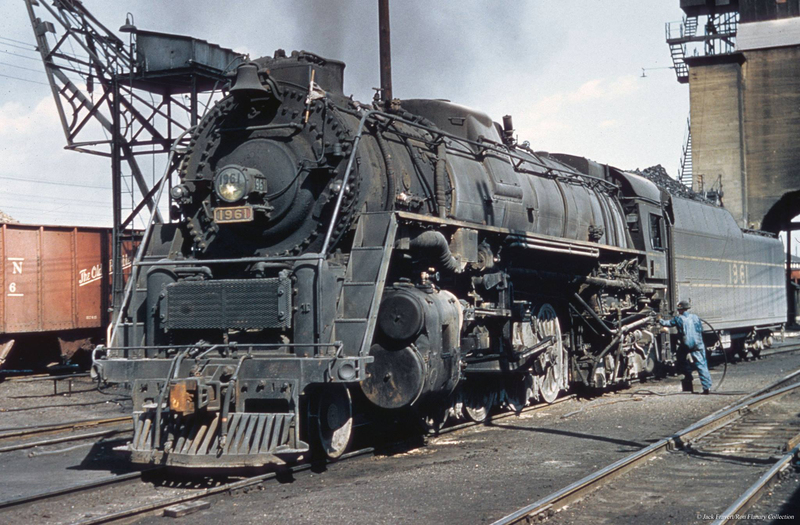 It worked with railroads such as the ACL, Florida East Coast, Pennsylvania, B&O, Southern, and others in this regard handling well-known passenger trains such as the Piedmont Limited, Crescent, and South Wind. 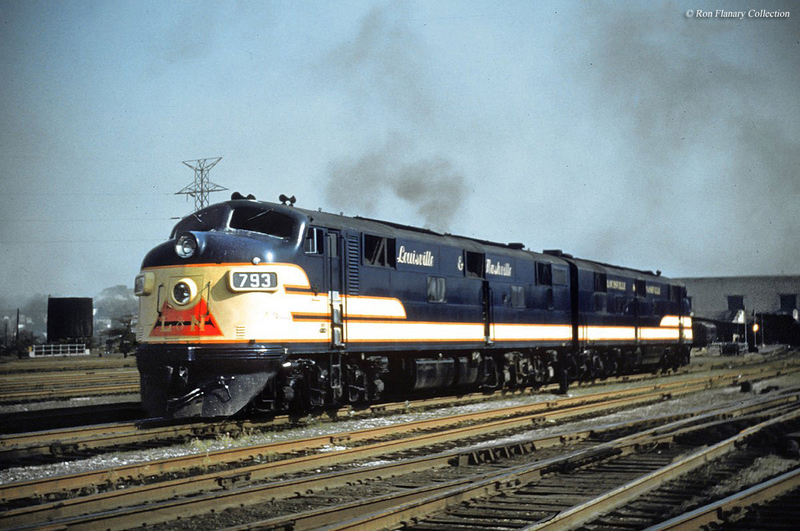 Of course, the railroad also owned a few notable trains of its own including the Pan American (Cincinnati-New Orleans) and Dixie Flyer (Chicago-St. Louis-Florida). As traffic sagged after World War II it lost interest in these services, eventually abandoning its gorgeous livery of deep blue and rich vanilla for a much simpler scheme of grey and yellow. By the Amtrak era, which began on May 1, 1971, many trains had been discontinued. Azalean: Operated between New York and New Orleans in conjunction with the Pennsylvania Railroad, Southern Railway, and Atlanta & West Point. Dixieland: Operated between Chicago and Miami in conjunction with the Florida East Coast Railway. Piedmont Limited: Another of Southern Railway's passenger trains which operated between New York and New Orleans in conjunction with the Pennsylvania Railroad, Atlanta & West Point, and the L&N (which took it to New Orleans). As Mike Schafer notes in his book, "Classic American Railroads," its lines ran through both the North and South; Kentucky was a member of the Union while Tennessee's loyalties lay with the Confederacy. Its trackage was destroyed by both sides (the Baltimore & Ohio, whose main line ran through the heart of the fighting in northern Virginia/West Virginia and Maryland dealt with a similar issue). Financially, the L&N weathered the war relatively well and exited the conflict in good condition. It was soon expanding again as the railroad's growth continued into the following decade, eyeing a direct route to the Gulf Coast. In 1872, through a series of small acquisitions it reached Montgomery, Alabama. The area around present-day Birmingham contained some coal and iron deposits, which spawned a local steel industry that helped fuel L&N's further southward expansion. In 1881, it finally reached New Orleans via Mobile, Alabama via the Montgomery & Mobile and New Orleans, Mobile & Texas. Two years later, in 1883, it opened a 170-mile corridor from Pensacola to Chattahoochee, Florida, its furthest reach into the Sunshine State. The railroad's growth at this time witnessed a flurry of activity in all different directions. According to the book, "Limiteds, Locals, And Expresses In Indiana, 1838-1971" by author Craig Sanders, the L&N acquired its extension to St. Louis when it took over two separate components of the St. Louis & Southeastern; in 1879 it purchased the road's Kentucky and Tennessee Divisions between Nashville and Henderson, Kentucky; then a year later, on May 1, 1880, added the Illinois and Indiana Divisions between Henderson/Evansville and St. Louis. The segment from Evansville/Henderson and Nashville had been built by the Evansville, Henderson & Nashville, established in 1866 and opened in April of 1871. It was the vision of Evansville business leaders who wanted a direct rail artery to Southern markets. Following the EH&N's completion it was acquired by the StL&SE in 1872. The latter was chartered in 1869 to build from East St. Louis to Evansville, opening in late 1871. Beyond St. Louis the L&N looked to dominate rail service across Tennessee. In 1880 it acquired long-time rival Nashville, Chattanooga & St. Louis through a hostile takeover. The so-called Dixie Line, reached points throughout its home state such as Memphis, Chattanooga, and Nashville. In 1890 the NC&StL leased the Western & Atlantic Railroad from the state of Georgia which gave it a direct connection to Atlanta. Despite L&N's takeover, the Dixie Line remained largely independent with locomotives numbered and rostered independently. In addition, early first generation diesels wore a separate livery. It remained this way until August 30, 1957 when the NC&StL was formerly merged into the Louisville & Nashville. In 1881 the L&N gained control of the Louisville, Cincinnati & Lexington, which provided it access to Cincinnati, Ohio as well as a branch to Lexington via the state capital at Frankfort. During early 1882 the railroad appointed Milton H. Smith as vice-president and traffic manager. He would soon ascend to the presidency and oversee L&N's expansion through the end of the 19th, and into the early 20th century. With a route to Cincinnati now established it focused efforts in eastern Kentucky. Heading south from the Queen City it extended to Livingston, via Lebanon, and Jellico, Tennessee by 1883 where a connection was made with what later became the Southern Railway. The ultimate goal was Atlanta and a more direct route to Cincinnati. Much of this growth, once more, came through acquisition. 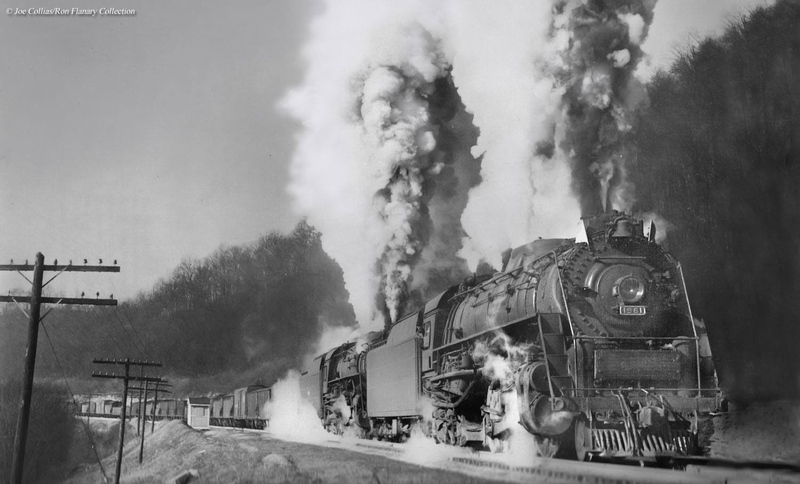 It picked up the Kentucky Central Railroad in 1891 between Covington, Kentucky and Livingston then constructed a new line into Knoxville, connecting there with the Knoxville Southern and Marietta & North Georgia. It later purchased these roads outright in 1902, offering a link to Marietta, Georgia. Finally, as previously mentioned, it arrived in Atlanta via the Western & Atlantic, a system leased to subsidiary NC&StL in 1890. With the L&N’s through routes in place by 1905 the railroad shifted focus towards building up its freight business. Since lines were already located near the rich coalfields of eastern Kentucky it seemed logical to expand into these regions. 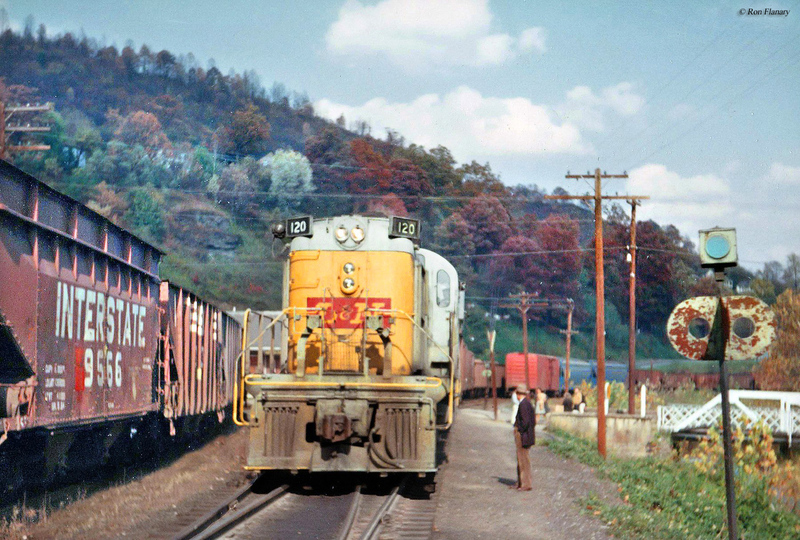 The move also opened connections with the Norfolk & Western, in the process of constructing a western extension from its main line at Bluefield, Virginia (near the border with West Virginia). The L&N began work on its new route during April of 1886. It extended away from the main line at Corbin, Kentucky and headed southeast towards Middlesboro, reaching there in 1889. It then continued east to Cumberland Gap, Tennessee before turning northeast to the small hamlet of Ewing. The branch would eventually connect with the N&W at a location known as Norton, via Big Stone Gap and Appalachia, during April of 1891. These coalfields were extremely bountiful, so much so that four railroads eventually reached there including the N&W, L&N, Southern, and the small Interstate Railroad (constructed solely for the purpose of moving black diamonds). The L&N acquired an entire cluster of lines here with other extensions reaching Glenbrook, Manchester, Herron, and Lynch (all located in Kentucky). Collectively, the network was known as its Cumberland Valley Division. Traffic grew so strongly that it took the uncommon step of double-tracking the corridor between Corbin and Loyall (68 miles) in 1926. In 1910 the L&N further expanded its coal business through the Lexington & Eastern Railroad running between the state capital and Fleming, near the Virginia border. Several short branches were subsequently built here to serve additional mines. As with the Cumberland Valley Division, what became known as the EK Lines (for “Eastern Kentucky”) were also double-tracked between Winchester and Blackey. From this point forward the railroad spent most of its resources and energies upgrading lines and its overall property. Surprisingly, the L&N never reached Chicago until 1969 when the railroad took over the Chicago & Eastern Illinois’ main line via Evansville. The two roads had long interchanged trains here prior to this event. Two years later it purchased Indiana's Monon Railroad in 1971 and gained an additional route to the Wind City via Indianapolis. The final system map of the L&N, as seen above, featured a spaghetti of trackage in its home states with extensions to Chicago, St. Louis, and New Orleans. 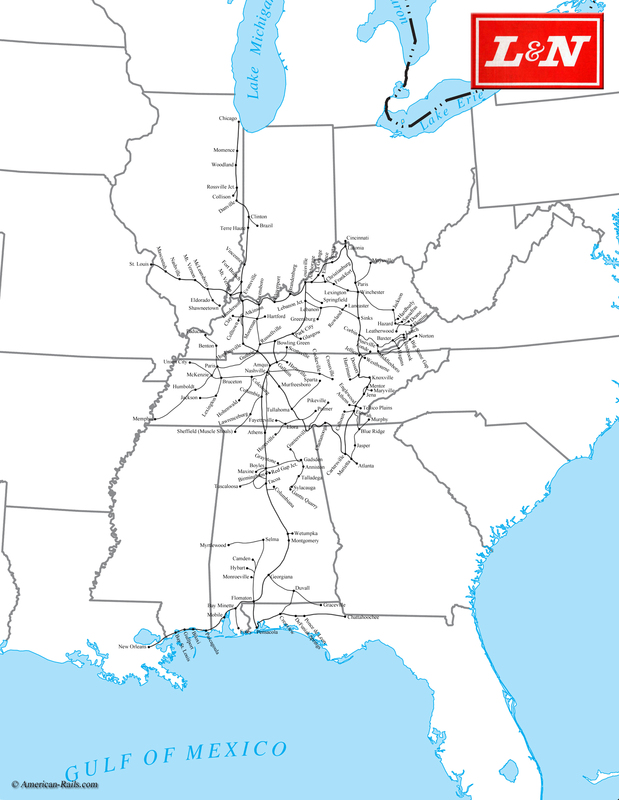 Its key corridors were largely double-tracked including Cincinnati - New Orleans, Cincinnati - Atlanta, Evansville - Louisville/Nashville, and Memphis - Nashville - Atlanta. In addition, numerous secondary lines veered away from these main lines. Its route mileage as of 1950 stood at 4,779 miles. The movement of coal always remained a key commodity. However, it also handled many types of other freight ranging from agriculture and forest products to merchandise and chemicals. The 1970s signaled the end for the Louisville & Nashville’s independence. It had been controlled by the Atlantic Coast Line since 1902 and then joined the Family Lines System banner of the 1970s. This marketing consortium included the then-Seaboard Coast Line, Clinchfield, and a number of other smaller lines. With this came a new livery applied to all railroads involved (with sub-lettering stenciled under locomotive cabs identifying each company) and gone was the L&N’s famous gray, yellow, and red livery. As the 1970s gave way to the 1980s the L&N would officially disappear, dissolved through merger when the Family Line System officially became the Seaboard System in 1982. This short-lived conglomerate helped the corporate transition into what eventually became the CSX Transportation banner, officially born on July 1, 1986. The large Class I was formed largely through the Seaboard and Chessie System, which included the Baltimore & Ohio, Chesapeake & Ohio, and Western Maryland. While the L&N is no more today the system and railroad it left behind continues as an important part of CSX’s southern lines.